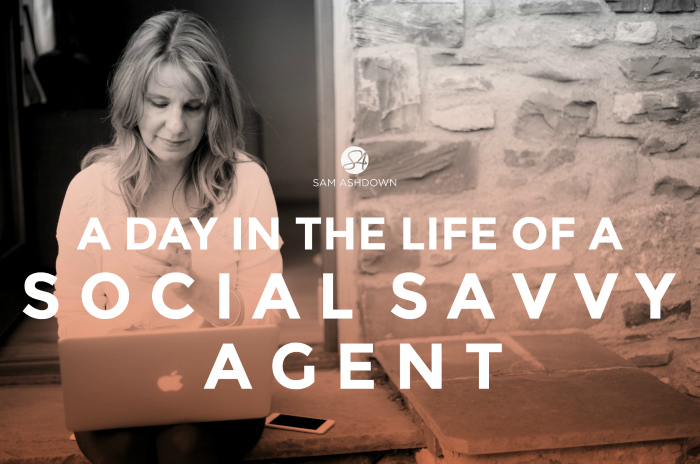 A day in the life of a social savvy estate agent. When you go about your daily business as an estate agent, do you simply rush from morning meeting to viewings, viewings to valuation, valuation to the office, clear your inbox then clear off home? On your travels, in your everyday tasks, do you ever think about your social media accounts? Or is that “someone else’s job”? If it is, you’re missing a trick. Because the best person to create relevant and exciting social content, it is YOU. Let me tell you about my day. It started in London, at 5.30am. 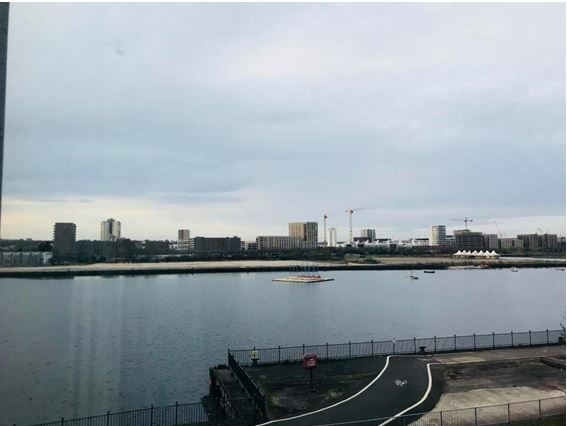 Last night I stayed at a hotel near the Royal Victoria Dock, and this morning as I got up, the sun was just rising, casting a rosy glow over the water. So I snap a couple of photos, and save them for later. Then it’s off to Euston, to catch my train back to the Lake District. It’s a bit of a dull day, so no real photo opportunities on my journey. I get to Oxenholme just before noon, and head into the office. 3 o’clock, and we have the new market appraisal on a house with an amazing lake view. I ask the owner’s permission, and snap a photo of the lake from her living room. As I turn around to talk to her, I see her cat is making a very pretty picture in the daffodils in her garden. So I take another quick snap. After a chat, we head on up the garden, where I take lots more photos. In this point, I still haven’t posted anything, on Facebook, Twitter or Instagram, because I just haven’t had the time. But they are all saved safely in my camera roll on my phone. We say goodbye, and next in my diary is a dinner date with a friend for her birthday. My daughter and I stop to buy some flowers from a very pretty florist’s in Windermere. As we enter, I look around, excited. I love going in here; there’s a photo opportunity everywhere I look. 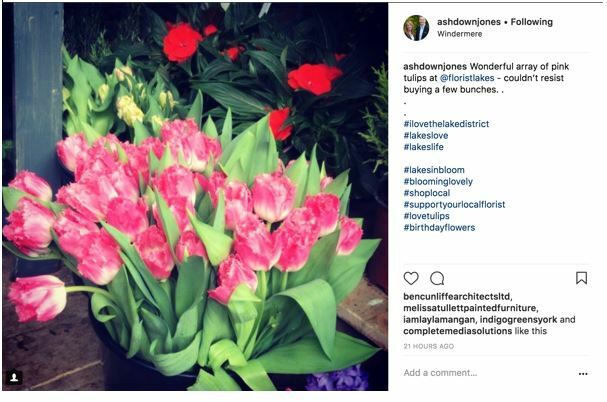 As the lady wraps the bouquet of tulips I’ve chosen, I take a few photographs of the shelves and displays, and ask the florist for her Instagram account. I promise to give her a shout-out on Instagram, and she says she’ll follow us back. Next stop, the restaurant. My friend Jason has just opened this fabulous restaurant recently, and I’m very pleased to be able to give him a promo. The evening lends itself to lots of photo opportunities: the food, ourselves, my friend’s sparkly birthday pudding; they all make great social photos, in which I can tag Jason and his restaurant. I love being able to support my local businesses by promoting and recommending them when I can. As we leave the restaurant, I notice a hair salon I haven’t been in before, and it’s still open. 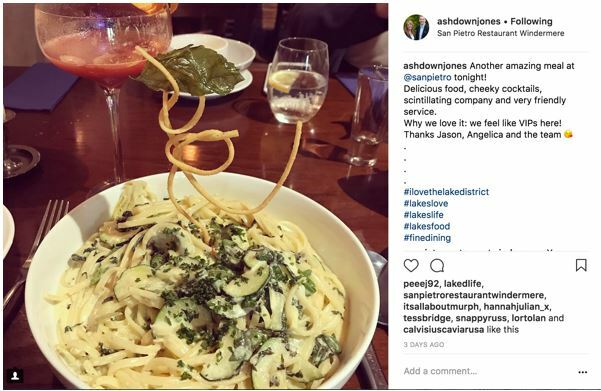 I know I’m following her on Instagram, so I pop my head round and say “Love your Instagram account!” I tell her that I’m Sam from AshdownJones. She’s friendly and introduces herself, and I know we’ll connect now on Instagram and that she’ll notice when I post or comment on hers. I arrive back home, and notice the sun setting over the mountains. I take my last photo of the day, thinking I’ll edit it and upload onto Twitter later. Almost every activity from my day has given me the opportunity to not only create content for our various social media accounts, but also to support local businesses, who will in turn support us. I often hear they the complaint from agents that social media just takes up so much time. That it brings no real return on investment. Neither of these two statements is true. Asking the ROI of a social media account is like asking what the ROI of your email inbox is, or your phone, or your car. Each of the photos I took today, only took a few seconds. The editing and posting, I do when I have downtime: sitting in front of the TV, relaxing before I go to bed, or in a rare quiet moment at work. But those few seconds and those few photos, added up over time, create a very valuable asset in our business; a library we can be proud of; a gallery of images and words that reflect not just our brand, but our personality, our values, and our support for our local community. 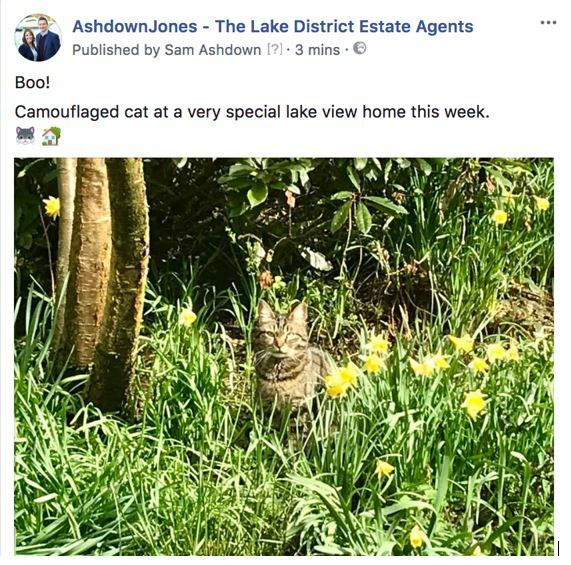 So many estate agent social media accounts I see are full of boring photos of their latest listing, their branded car, their recent review. Would you want to follow your agency on social? It’s time to up your game on social media. Look at the people who’ve liked your page: what are they choosing to follow on social? On Instagram, it is easy to see which pages one of your followers are in turn following. Same with Twitter. On Facebook, take a look at any of your page fans that are also your Facebook friends, and look at which Facebook pages they are following. Check out the frequency, tone, visuals, and brand messages of these popular accounts. For example, the best Instagram accounts are colourful, on-brand, exciting, fun, and engaging. The best Facebook pages are just as interesting, and also offer extra insights into behind-the-scenes of the brand, the people behind the logo, and the personalities that make them stand out. The most popular and successful Twitter accounts are highly communicative, and make sharing and tagging a central part of their posting strategy. What can you do to make your brand a visual smorgasbord of treats and delights on your main social media platforms? 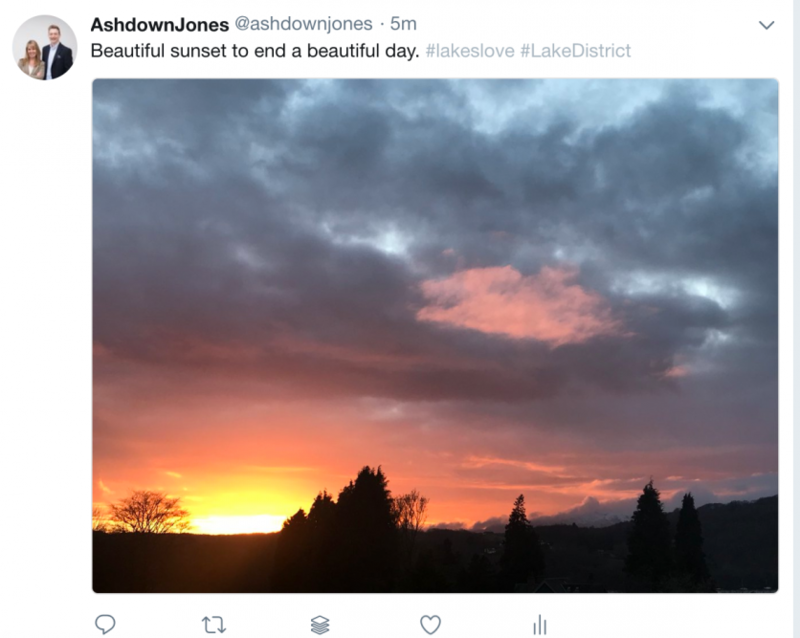 How can you become more engaging on Twitter, more visual and exciting on Instagram, and more warm and friendly on Facebook? Show your personality. People want transparency, authenticity, and a real connection. Keep your phone in your hand, look for opportunities, snap away and post, post, post. Get into the habit of it, and it will become second nature to you, just as it is to me. Because at the end of the day, it’s just about being social. Previous post Your Facebook interests.